As the temps dipped below freezing I started digging around for blankets for the kitties. We have several afghans they can curl up in, but I can't leave them out unsupervised now that Teek has shown himself to be a teething chomper. He'll take a big bite of an afghan and pull his head back trying to rip pieces out. How did I manage to adopt a yarn eater? Gah! I needed to come up with an alternative for cat warmth. Enter my ugly first quilt. 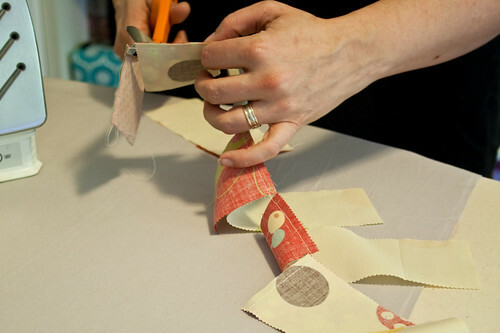 When I wanted to learn to quilt 14 years ago, I signed up for a class in the only fabric store in Whistler. Their selection was small and the teacher was more than a little uptight. The first class in the series was all about colour choices. When I reached for some greys and some blacks, the instructor came over to me and tsktsk'd my choices. "Oh honey, you don't want to use blacks or greys in a quilt. It will be too dark and ugly. 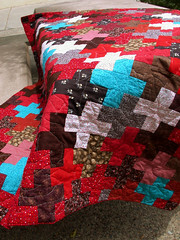 Quilting should be about lovely colours and pretty things." I should have known right then to RUN AWAY FROM THE SCARY LADY, but I didn't. 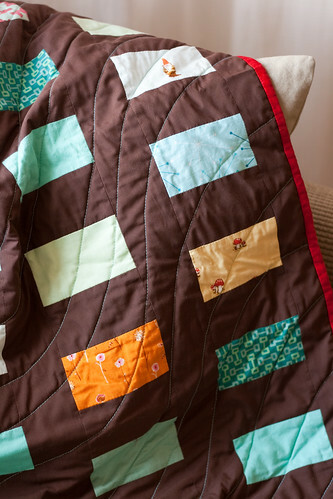 I compromised and sewed the quilt with fabrics that I didn't love (except the backing. Still love that plaid.) While I learned a lot in the class, the result was a quilt that I don't like and have only ever used as a cat bed. For some reason it never saw the light of day in Texas, but it's back in rotation now. And I know just the bitey cat that can use it. Summer in Austin is much more conducive to quilting than knitting. The thought of sitting under a hot task lamp with 3 feet of silk in my lap with the AC cranked is not very appealing. Consequently Hanami is hibernating for a few days while I resurrect an old quilting WIP. The brown coin quilt I started last September has been hanging on the back of my studio door for 10 months now. 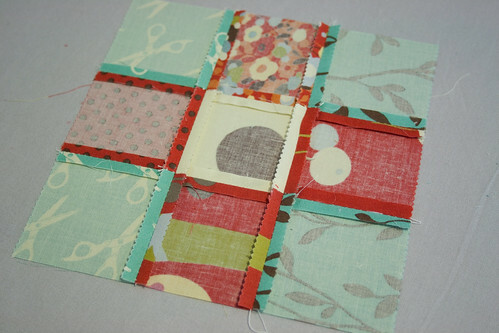 This week I took it down, gave it a good press and finally sewed on the remaining border strips. The only decision I have left to make is which fabric to use for the backing. The red is a perfect colour match with the top, but I'm not jazzed about the busyness of the white flower repeats. The yellow-green doesn't necessarily coordinate as well colour-wise, but it's a more sophisticated print. I'm leaning towards the green, but I can't make up my mind. When I'm putting together a new quilt, I never realize where the colour inspiration comes from until I'm knee-deep in the project. Last week I started piecing a baby-sized chinese coin quilt (partially inspired by one Wee Wonderfuls Hillary did ages ago.) I pinched the brown cotton from Mum's stash last summer and I've had the blues on standby for almost a year as well. I supplemented the scheme with a touch of orange and yellow (Heather Ross's gnomes and mushrooms from Cia's Palette) and some random scraps. The half-pieced quilt hung on my studio door for almost a week until I realized with a shock the colours weren't original to me. Look what I cropped out of the door photo. See that? Hanging from the doorknob? Those are wristlets that I finished four weeks ago and have been hanging in plain sight since then. Clearly I'm not as clever as I thought. 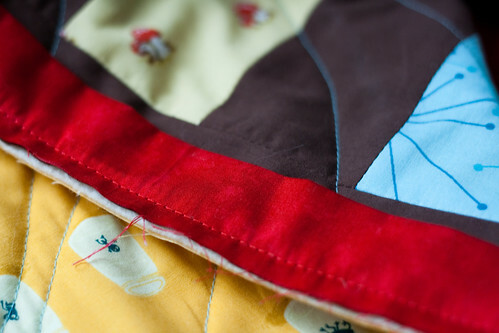 Over a year ago I started the Quilts and Quilting group on flickr. At the time when you did a search for quilt groups or even quilt tags there was almost nothing. Since then there's been a myriad of fantastic talents who have added their photos to the pool. I thought I might add to Eye Candy Friday by highlighting some of my recent favourites from the pool (seeing as I haven't time to do any quilting myself.) Some are tiny, some minimalist, some are still WIPs, but they're all quite amazing. It can be very inspirational trolling through the pool. Yesterday our lovely modern quilt-along hostess Kim posted an update of everyone's progress so far. You'll note that I'm not on the list. Not because I'm being snubbed by Kim but because I have done close to nothing on my Love Beads quilt. I can't say I haven't done anything at all, but the progress has been imperceptible at best. I’ve decided on colours, but finding the fabric has been the tricky part. 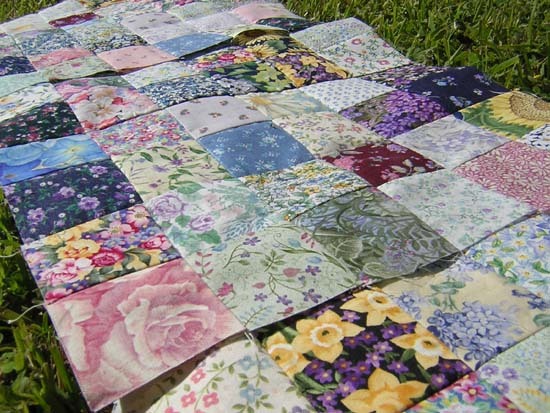 While I was in Vancouver in August, I helped my mum organize some of her quilting fabric. The woman has TONNES of fabric. She could almost open her own shop. To be fair, she has downsized a lot, but she still has a monumental stash. Because that stash is so incredible, I'm hoping that she hasn't noticed that I poached some of the light blues from her quilting solids (Hi Mum! Love ya!). It just so happened that the pale, aqua colours were exactly what I had in mind for Love Beads. I've been cruising through fabric stores with little swatches of them, but I haven't found anything even close to the perfection of poached fabrics. I'm hoping I have enough, because they are going to be the beads in Love Beads. I've also been wandering around with a swatch of chocolate brown (also pinched from mum's stash) in my wallet but no luck finding anything suitable for the background and backing yet. I've got samples of the Kaufmann solids from Hancock's of Paducah, but they're not quite right either. All the browns are either really purple-y or washed out and chestnut-y. Anybody have any leads on where to find 15 yards of the perfect chocolate brown cotton? I've been really lucky in the past year in that I'm able to sew midday almost whenever I want. Having that flexibility has meant that I don't always sit down and use that time to sew and tinker. More than likely I'll get distracted by my knitting or random jobs around the house. 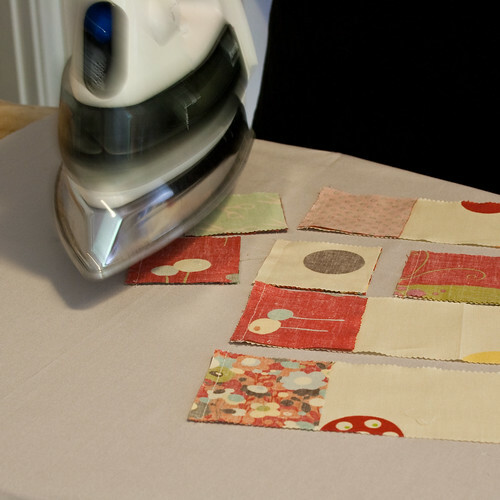 Ironing, fun! I've decided that it's time to put my nose to the grindstone and use the time I've been given to a semi-productive end. I'm going to put 2 hours on my schedule every weekday for time in my sewing room. 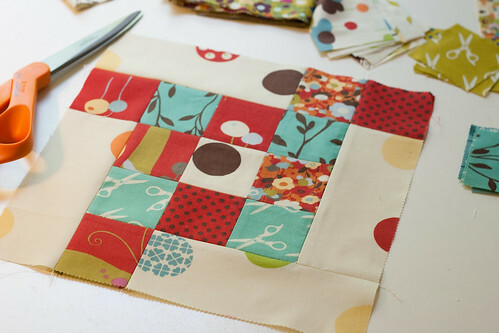 Quilting, sewing, designing, muckin' around, whatever. As long as I'm at my machine with the iron on, it'll count. I sat down today with a hunk of muslin and some yummy variegated Gütermann thread to work on my free motion machine quilting skills. Lordy, do they need some work. I've been trying to concentrate on stippling without overlapping the stitching. I find it really hard to maintain an even pattern without adding in a big loop over something I've already done. I catch myself heading into corners with no escape. Whoops! Keep practicing, right? I'd like to get better at stippling in anticipation of starting my next big quilting project. Kim over at dioramarama has started a modern quilt-along that I simply couldn't resist joining. 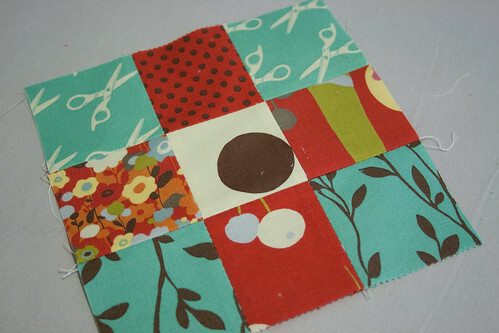 The idea is to quilt something with the Modern Quilt Workshop book as the starting point. I've been pouring over the book since it arrived. I think I've decided on the Love Beads pattern for a queen size quilt for the bedroom. The vision I have right now is a medium brown with light blue beads and dark blue strings, red binding or some variation thereof. I'm basing my Big Idea off a previous Big Idea I had that I painted on the wall in my Vancouver condo. PBR is all done. Quilted. Bound. Washed and dried. 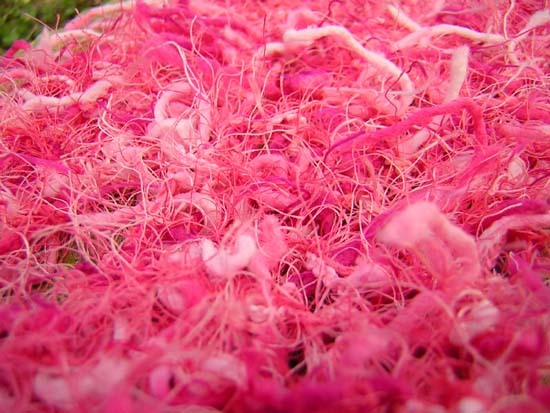 I love the colours, but I'm biased - I have a pink, black and red problem as you know. I free-formed the quilting into long swoopy lines. I'm really digging the juxtaposition of the rounded curves against the squares. The finished size came out to around 22" x 30". Ain't she pretty? Somehow two of my black cotton squares turned out to not be cotton at all. Ripped and shredded. Is it poplin? I don't know. I don't know where it came from or how it got mixed in with my cottons or why I didn't notice them before. I'm devastated and I have no idea how to fix this. Fuse a new piece down with wunder-under? Applique something over it? I'm at a loss. Anybody have any ideas? One of the dirty secrets about quilting is the amount of thread trimming that goes on. Once you have a quilt top assembled, you have to flip it over and trim off ALL the errant thread ends and clean up the back of the quilt before you can sandwich it with the batting and the backing fabric. I always think about leaving them and not worrying about it, but I know those little buggers will sneak out and worm their way to the top of the quilt eventually. It's a bit of a pain but it's a necessity. 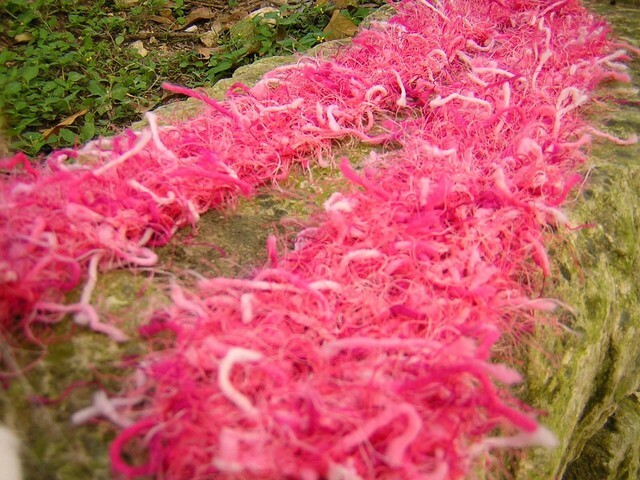 I guess it's like weaving in ends on knitting - nobody *really* likes to do it, but there's no way around it. In case you haven't figured it out yet, I've chosen PBR as my next 'just finish it already' project. So this afternoon that's what I'll be doing. Snipping. Snipping. Snipping (and catching up on all the MDSW recaps.) I'm hoping to start quilting it tomorrow. I picked up some matching red and black variegated thread and I'm excited to try it out. While I'm snipping and quilting and reading I'm plotting ways to save up some dough and get to Maryland next year. Using stash fabrics and finishing old projects should be a good way to start, hey? It's done! Nathan's neverending baby quilt is done! Sure, it's a year overdue. Sure, it's really too small for him to get any decent use out of now that he's over a year old. Sure, I forgot to put a label on it, but whatever. It's finally complete. I'm hoping they can still use it to throw over his legs in the stroller or in the car seat or something. Maybe he'll adopt it as his bankie and he'll just carry it around. One can hope. 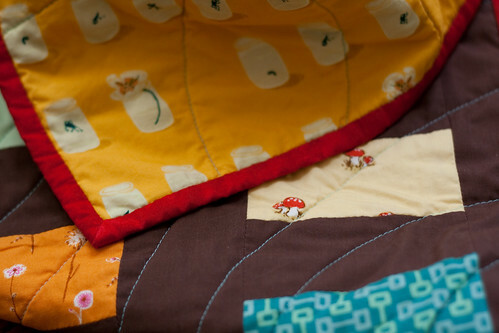 I started this wee little quilt just over a year ago (hence the name Nathan's Neverending Quilt.) I pieced the top together over a weekend and got rolling on machine quilting it that same week. Easy peasy. I should have been able to finish it in under 6 days. 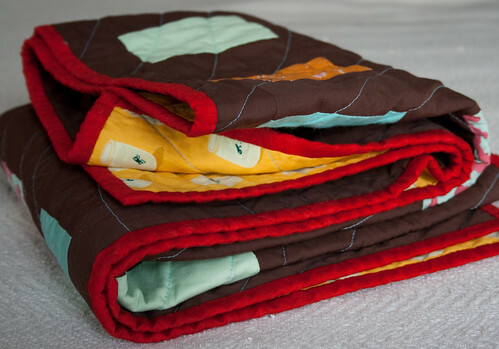 Lord knows I've made a whack of other baby quilts in less time than that. After many trials and tribulations with the invisible thread (Satan's Thread), and many, many months sitting in a drawer in time out, I finally pulled the little guy out yesterday to finish it up. 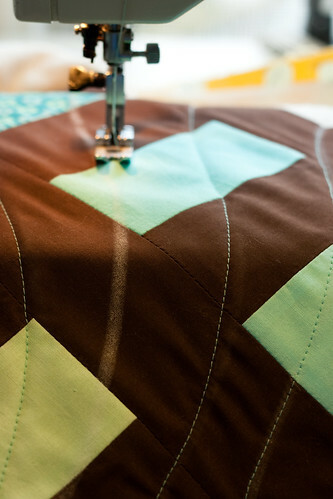 I'm just doing some simple echo quilting in the darkest pinwheels so it's breezing along nicely now. I'm using navy thread for the top and a red thread on the bottom to match the red flannel backing. It seems to have won favour with Indy. I can't seem to keep her off it. She's been sneaking onto my desk at all hours to see if she can nap on it. I'll turn my back for a second and she's there in a flash. I can be fanatically organized and a little OCD about my work spaces. I like things to be neat, orderly and disciplined looking before I can start on something. Clean lines, minimalist colours, everything in it's place. I think that's why quilting is so enjoyable for me. I get to take a mess of colours, shapes and fabrics and organize them in a way that I find pleasing. The Pink, Black and Red Quilt has taken shape (hey, that's PBR! yum!). It needs to be a little wider yet, but it'll be a cute stroller blanket to send to a pal for her new baby girl, EB. 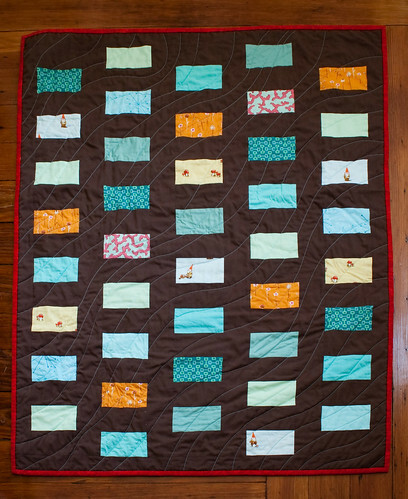 This is the beauty of a baby quilt. You can put the top together over a weekend. To be fair, I did do *some* mending before I broke out the new fabrics. I also made the inside liners for a dozen new cd cases, so I haven't completely forsaken the Giant Pile (now the Medium-sized Pile). I've had a rekindling of the quilting bug though; a well tuned sewing machine is a siren call to hard to ignore (I haven't even tried). I've done so much rotary cutting today that I almost have a blister on my hand. 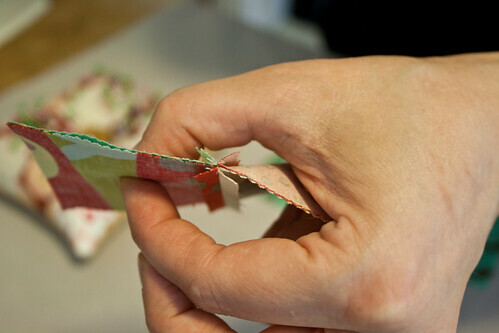 This is my favourite part of quilting. Crisp little squares all lined up ready to be chain-pieced. Delightful stuff.